Note: In researching terrible mascots, the plethora of available options is just too much to resist stretching this feature out to a four-parter. Take a look at our BCS post and keep an eye out for the FCS and DivII / DivIII editions. Keep voting as the winners of the 4 posts will face off in an ultimate lame mascot challenge. Before moving on to the FBS schools that don’t get a chance to take home the National Championship, as a Virginia Tech alum I cannot resist the urge to pontificate on that new UVA mascot. Though it may not be one of the 5 worst BCS mascots, it is definitely in the top ten. This is so bad it needs some quickfire jokes, Daniel Tosh style. Let’s put 20 seconds on the clock: Is that a horse, a hippo or a California Raisin? Some kid called, and he wants his Thing Hands back. Mascots can’t resemble Native Americans anymore, but this proves the NCAA thinks it is fine for your mascot to dress in blackface. Is that logo ironed on or is it just a sticker? He’s ready for the upcoming 90’s frat party – he already put on his MC Hammer pants. I’m pretty sure The Hoo crapped this out in 1983 and it just recently escaped from the sewers of Charlottesville where it has been living a life of solitude, prostituting itself out to drunken frat guys and feeding on the blood of the homeless. Now that I have that out of my system, I present LND’s lamest mascots from non-BCS Football Bowl Subdivision schools. When you have a nondescript nickname like the Zips, your mascot can be whatever you want it to be. Akron could have gone with a lion, tiger, bear, eagle, gorilla, or any number of menacing mascots. They also could have gone for a local theme, and since Akron is known as the “Rubber Capital of the World”, my vote would have been for a giant condom. Instead, they went with this far from intimidating Kangaroo. On Zippy’s website, he claims his favorite food is stadium hot dogs. Something tells me that is not the only kind of sausage Zippy enjoys. MTSU’s sports teams are known as the Blue Raiders, so logically their mascot is a Pegasus. They got the blue part down, as that thing looks like Papa Smurf should be riding in on it. As a Pegasus, he uses his wings to fly. That means the only thing the cape could possibly be for is his weekend job performing magic at birthday parties. TA-DA! 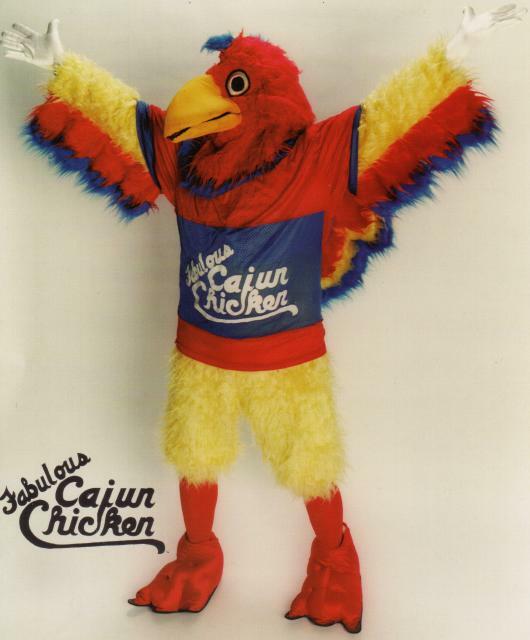 The Ragin’ Cajuns of Louisiana Lafayette have a long history of bad mascots including the drunken Cajun Man and the even more drunken Cajun Chicken, but in an effort to outdo themselves they came up with this atrocity. As if the pepper to the left wasn’t bad enough, the university felt the need to share the image to the right of what Cayenne looks like when he takes the football jersey off. That angry dragon turd is going to haunt my dreams. The Tulsa Golden Hurricane felt the need to justify this ridiculous superhero getup by actually giving him a back-story and some super powers. Apparently, the Captain “carries a hurricane-summoning sword, energy-sourcing thunder boots, lightning bolt blaster gloves and a wind-current flying cape.” Even the super-lame Captain Planet had better superpowers than that. It must be awfully hard to fly with those huge cement blocks for feet. And nothing lets people know you are a superhero quite like that inverted soul patch on his forehead. They would have been better off with Captain Crunch as their mascot. As discussed in a previous LND post, a horned frog is actually a lizard that can squirt blood from its eyes. Somehow TCU manages to take the bloody eye lizard and make it even less kid friendly. It looks like the weird love child of the Predator and Felix the Cat. When you add the fact that SuperFrog is like 8 feet tall, there isn’t a preteen in the world that will go within 20 feet of this creature. I do enjoy that Felix the Predator takes his fashion tips from Doug Flutie, however. Nice belly shirt, SuperFrog. Nice belly shirt, indeed.